We've been building class-leading scooters for many years. But we felt that we could do even more for those urban commuters who are are looking for a realistic and affordable alternative to public transport. The Tricity's beautifully styled bodywork gives this lightweight 3-wheeler a dynamic and contemporary image. Its flowing lines and sleek profile project a smart and sophisticated look that underlines this urban commuter's agility. 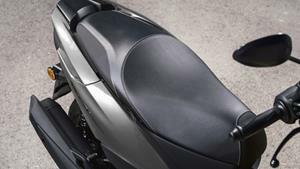 And the sports screen and flared legshields provide added protection from the wind and weather. For lively acceleration as well as excellent fuel economy, the Tricity 125 is driven by Yamaha's latest Blue Core 125cc liquid-cooled 4-stroke engine. Producing 9kW, the Blue Core design achieves greater performance using less fuel, making the Tricity 125 one of the most efficient and economical ways to move! 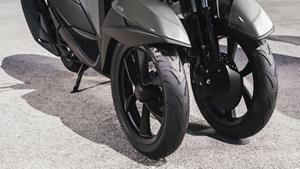 Yamaha's exclusive Leaning Multi Wheel system has been designed to deliver easy steering together with confident cornering and a natural scooter-like handling feel. Featuring a parallelogram link and independent dual telescopic forks, this ingenious system allows the twin front wheels to lean around corners, making the Tricity a joy to ride. For relaxed ergonomics there's a wide and flat footboard - as well as a long dual seat. This layout gives a comfortable riding position, and it also enables you to get on and off the Tricity quickly and easily. 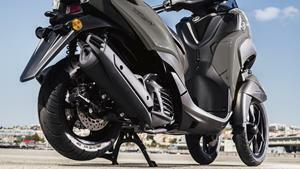 There's also a large storage space for a full-face helmet under the seat, as well as a convenience hook up front. The Tricity is an unique lightweight urban commuter featuring an innovative 3-wheel chassis design that gives a real feeling of stability and riding confidence on various road surfaces. 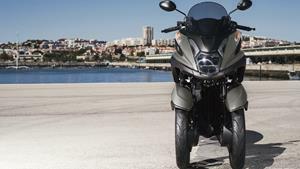 Featuring twin front wheels positioned closely together, the Tricity is agile and easy to ride, making it an ideal choice for both male and female owners. As well as being remarkably light at just 156kg with a full tank of fuel, the Tricity's engine and chassis have been designed to give a balanced, easy and confident handling feeling. Which means that when you're riding in the city it's one of the most convenient and enjoyable ways to get around - and with 3 wheels, parking couldn't be simpler! Dual 220mm diameter front discs and a 230mm rear disc provide plenty of stopping power - and for added confidence, ABS is fitted as standard. The Unified Brake System automatically optimizes the front and rear braking force when you the pull the left lever and when you operate both levers together, giving smooth and effective braking. With its stylish design, lightweight handling and scooter-like agility, the Tricity is ready to transform your daily journey to work. Its beautifully styled bodywork and spacious seating position allow you to travel in comfort, and the rider friendly features and low running costs make this the most efficient and enjoyable way to commute.